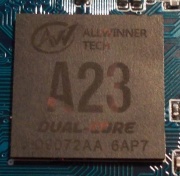 Allwinner A23 (sun8i) SoC features a Dual-Core Cortex-A7 ARM CPU, and a Mali400 MP2 GPU from ARM. It is a lower power cut-down version of the A20. The A23 is not supported in the linux-sunxi 3.4 kernel and in u-boot-sunxi, but there is basic support in the mainline Linux kernel (since kernel 3.17/3.18) and in mainline u-boot (since v2015.04). Featuring 1 vertex shader (GP) and 2 fragment shaders (PP). The SDK contains customized sources for U-boot, Linux, Android and buildroot. It also has a gnueabi cross compile toolchain. Boot0 initializes the DRAM, basic clocks and loads U-boot from NAND or MMC. There is no boot1 on A23. Boot0 directly loads U-boot. Allwinner has in the meantime published the source code for boot0 in their github repository. fes1_sun8iw3p1.bin is for FEL mode. There are 3 U-boot sources available. Allwinner's SDK contains a customized U-boot, based on v2011.09. This works with either NAND or MMC. It contains drivers for LCD display, MMC, NAND, normal UARTs, USB OTG, RSB, PMIC, and the ability to update various images. u-boot-sunxi has basic support for A23, which includes UART console (including R_UART) and MMC. Disclaimer: no one has actually booted a kernel with this yet. Reduced_Serial_Bus driver (to talk to AXP PMIC). mainline u-boot has support for the A23 (incl. SPL and AXP223 PMIC support) since v2015.04. There is a kernel tree currently available which contains a quick backport of the A23-v1.0 SDK, it is called "a23sdk_frankenkernel". Patches for basic A23 support on mainline have been posted on the mailing list. You can also find them here. We are still waiting on action from Allwinner to resolve this. This page was last modified on 1 June 2018, at 10:33. This page has been accessed 128,651 times.